Distribution: The bluegill is a species of sunfish that has been introduced into most water bodies in New Hampshire and is now widespread. Its original range included the St. Lawrence and Mississippi River basins and Atlantic slope drainages as far north as Virginia. 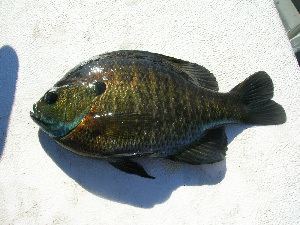 Description: Bluegills are bluish green to gray colored sunfish with dark vertical bands. There is a dark spot on the operculum, above the pectoral fin, and also at the rear of the dorsal fin. The lower jaw and cheeks are slate blue in color. Spawning male bluegills develop a reddish tint and their colors become more pronounced. 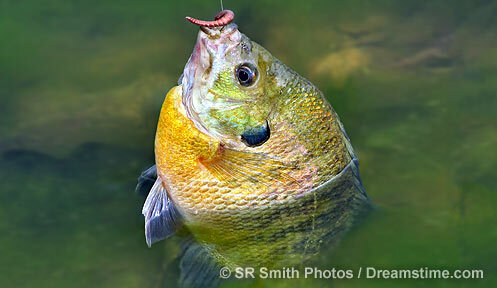 Habitat: Bluegills inhabit ponds, lake shores, or slow flowing rivers with aquatic vegetation. Life History: Bluegills thrive among thick aquatic vegetation where they feed on invertebrates and small fish. They are often found with pumpkinseed sunfish. Like other sunfish, they lay eggs in shallow circular depressions, excavated by males, along the shoreline. Males aggressively defend their nests. Bluegill females may lay up to 27,000 eggs and they remain reproductively active as long as water temperatures are suitable, which in some years may extend into late fall. Bluegill sunfish can survive in very warm water temperatures and are considered tolerant of pollution and habitat alteration. 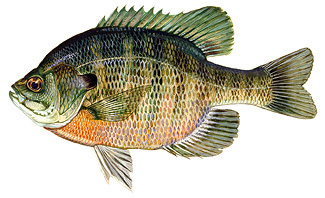 Conservation/Management: There are no specific conservation or management targets for bluegill.